Kyoto, the former imperial capital, is the top tourist destination in Japan for many good reasons. A lot has been written about this city already, and it's impossible to describe in a few sentences - so I'm not going to try to. Instead, I'll share some of my favorite destinations in a series of pictures and short descriptions -- as postcards if you will. Here's my first postcard from Kyoto. Kyoto is a city that hits the sweet spot for me in more ways than one. It is dripping with history, has fantastic shops, great art and craft galleries, and so many places to have a wonderful meal. It also has a lot of literal sweet spots. 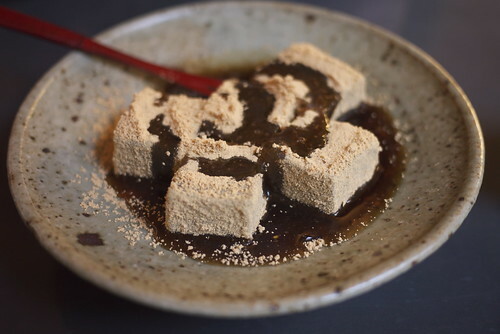 Perhaps because of its history as the seat of the imperial court, where ladies influenced much of the culture, there are many amami dokoro, or places to enjoy a bite of something sweet, both traditional and modern. One very traditional place is Kagizen Yoshifusa (Japanese only web site), with kissaten or tea rooms in the Gion district and near Ko-dai-ji temple. We went to the main store in Gion on a rather cold afternoon. You first go through the the very impressive old shop, where they sell wagashi (traditional Japanese pastries) to go. 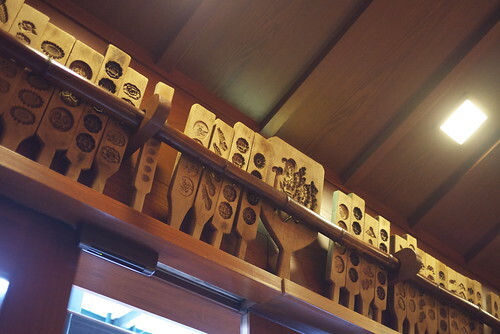 They have dozens of old pastry molds decorating the walls. 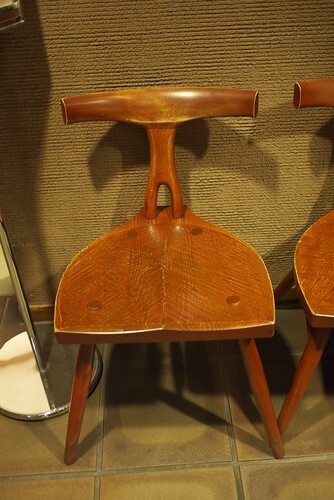 This retro-modern looking chair was at the entrance to the kissaten, which is in the back. I wanted so much to grab it and take it home with me. 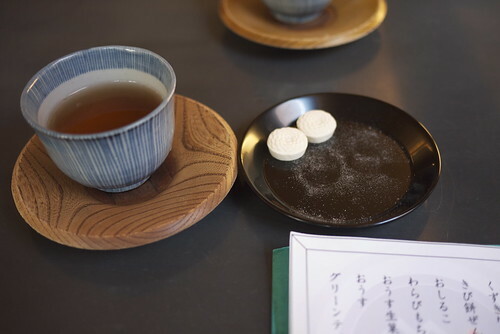 When you are seated at your table, you're presented with a cup of hoji-cha and some rakugan, sweets made of powdered sugar and rice flour, to nibble on while you peruse the menu. Rakugan really look far prettier than they taste, but the sweetness is a great foil for the tea. 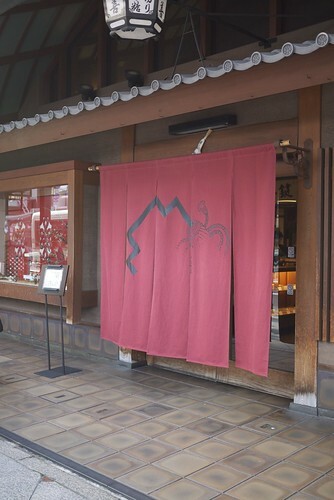 The speciality of the house is kuzu kiri - cold, slippery noodles made from kuzu flour. They are served in a large round tea container, apparently a leftover from the days when they used to deliver the kuzu kiri to tea houses in the area. 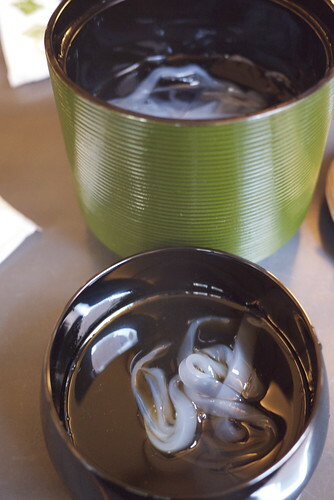 The noodles are dipped in a black (brown) sugar syrup. 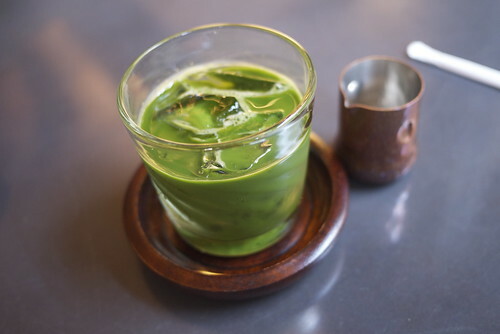 I had some iced matcha with the kuzu kiri - perhaps not the best choice on a cold day, but it was very refreshing. The warabi mochi - soft mochi made from steamed bracken roots, coated with kinako or toasted soy bean flour - was soft and delicious too. On the way out, my mother had to stop to place an order for some oimo-san, a wagashi that Kagizen is famous for. Here she is, contemplating her order in the beautiful front store. And this is what arrived back home a few days later - a pastry called Oimo-san, made from sweet potato paste. Not too sweet, with a touch of salt. As delicious as it is cute. The main Kagizen Yoshifusa store is at Gion-cho 264 Kita gawa, Azuma-ku in Kyoto. It's on the north side of Shijo Dori, in the Gion district. The nearest bus stop is Gion, and the nearest train station is Gion Shijo. Open 9am to 6pm, closed Mondays. 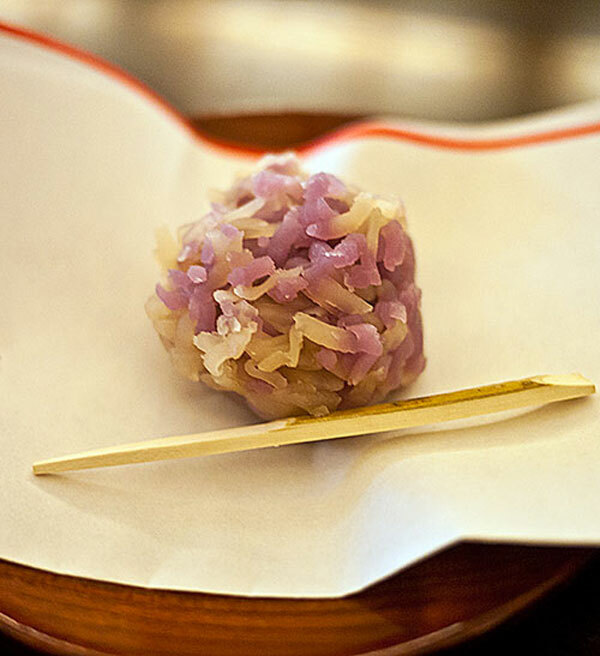 Wagashi is an all encompassing term for traditional Japanese sweet things. There are three main types of wagashi: Namagashi, higashi and han-namagashi. (I've seen it erroneously stated elsewhere that namagashi and wagashi are synonymous. Not so.) Namagashi are pastries that are moist and meant to be eaten right away. Higashi are hard, dried pastries that keep indefinitely as long as they are kept dry. 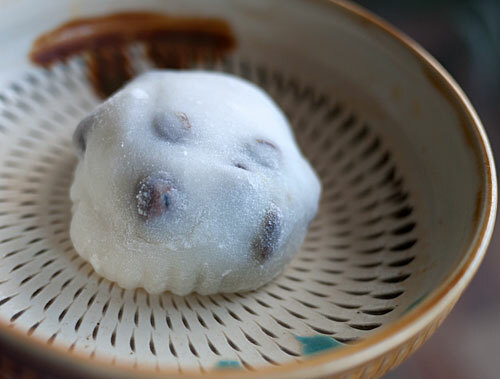 Han-namagashi are soft pastries that don't have to be eaten right away, but should be eaten within a few days. The rakugan pictured above (the hard sugar and rice flour flower-shaped things) are higashi; the kuzu kiri and warabi mochi are namagashi, and the Oimo-san is a han-namagashi. 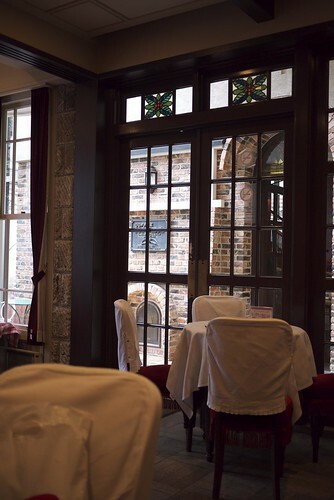 If you aren't into traditional Japanese pastries, there's no need to go pastry-less in Kyoto, since another tradition there since the turn of the last century is the elegant Western style cafe or coffee house. 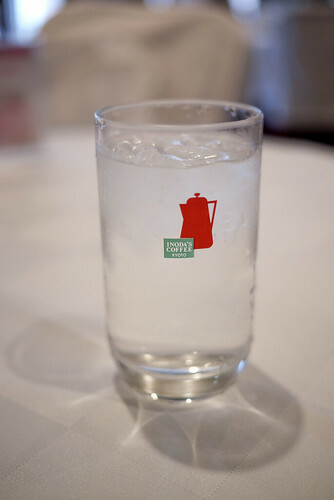 Many old-time cafes retain their early to mid-20th century decor and charm. 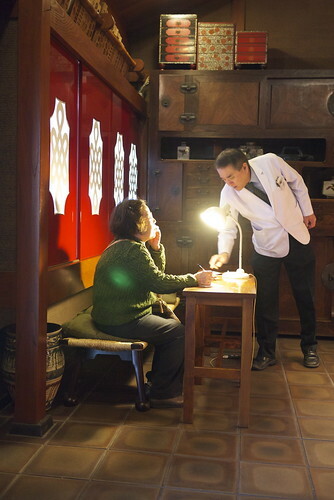 Inoda Coffee (Japanese only web site) is perhaps the best known Kyoto cafe. While they now have a few satellite stores in other areas of Japan, the main store or Honten is the place to go if you're in Kyoto. The outside has a split personality. The left side looks like a retro-modern coffee shop, and the right side is pure Kyoto machi-ya, or traditional wooden construction town house. 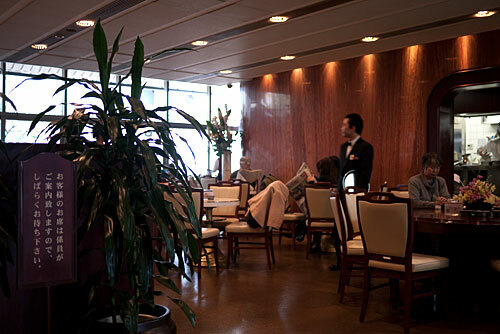 Half of the restaurant inside is pure '70s chic, with wood paneled walls and big green-leafed plants. This is the smoking section, where people leisurely sip their coffee and peruse the paper. There are seats upstairs too. The other, non smoking section is actually newer, though the decor is vaguely art-deco/art-nouveau/Victorian. You can enjoy a coffee or other beverage, a snack, pastries or other sweets here. 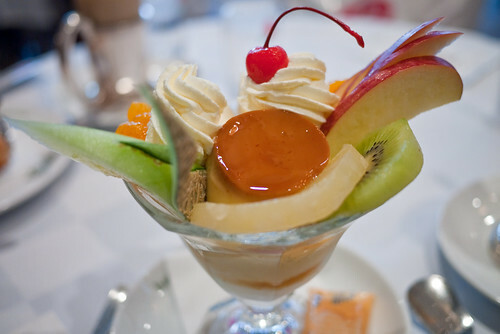 A very Japanese Western-style sweet is a loaded parfait or sundae, like this one, which features a caramel flan or purin. 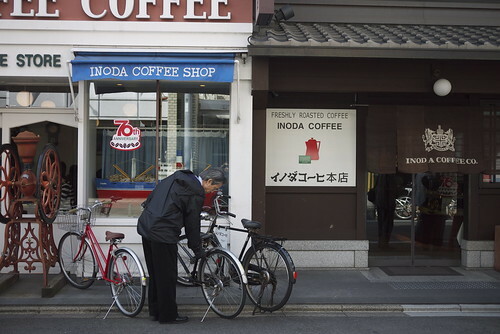 I love the Inoda Coffee logo. If you just want to buy some pastries from Kyoto, either Western or traditional Japanese style, to take home, the easiest place to do so is in the food halls of Takashimaya, Isetan, Daimaru or Hankyuu department stores. Isetan is right at Kyoto station, so it might be the most convenient place to grab a gift before hopping on the Shinkansen. The other three department stores are on busy Shijo Dori. My Kyoto map is a work in progress - I'll be adding to it as I post these Postcards. It's not going to be as extensive as my Tokyo shopping map, but it may be of help if you're inclined to like the kinds of shops and food-oriented places I do - that is, anything with delicious food, plus handmade crafts and the like! Submitted by maki on 2010-03-27 12:52. I lived 2 blocks from 出町ふたば this fall while I was studying in Kyoto, and I would sneak over and grab a mame mochi whenever I saw no line. Nothing quite like it and the absolutely fantastic 唐揚げや (kara age shop) 2 blocks into the shopping arcade next door. I'm off to Japan in six weeks, so I'm loving all these posts. My "places to go" list is getting very, very long! Also, just to let you know: the Tokyo map link is also taking me to the Kyoto map. Kyoto is such an amazing place, hope you're having fun in Japan, hit up a onsen while you're there! If you can manage at all (and don't have an aversion to Okonomiyaki / Yakisoba), I say go and try JUMBO's. It's a tiny place a few minutes east of Myoushinji kitamon, serves only okonomiyaki and yakisoba ... but it's a real all-sorts place. Due to its location it doesn't get so many salarymen, but there's families, students, old married couples from the neighbourhood, all sorts. The one downside is the fact that people will be able to tell you were there; the smell of made-at-the-table yakisoba/okonomiyaki clings for a while. Other than that ... Oimatsu (老松), north-east of Kitanotenmangu at the west end of Kamishichiken. :) And perhaps Miyako no yakata (都の邸) on the corner of Horikawa and Imadegawa? The Kyoto map link is corrected now! Billie, no I'm back 'home' (or my home in Japan that is), Yokohama. I can't write up trip reports during a trip...I'm too busy doing the trip part usually! I truly enjoy all those posts from Japan. There are all those 'little' details that unless you're there, chances are you won't know about. Reading your posts makes it much more 'alive' than the 'regular' info you get about Japan and its foods. I've been looking lately for a wagashi cookbook in English. Do you have any recommendations? Maki, I love you! I'm in Kyoto next week (first time) and I'll be using your map. I got busy trying to pin the locations on my maps while reading the post, so imagine my delight when I reached the end. Could you please add some more crafty links to your map if you can think of other locations, please? How I would love some warabi mochi. Sadly, the only wagashi that will survive a trip to Austria are things like youkan, which I love too, but aren't as delicate. Do you like yatsuhashi? Are they not from Kyoto too? Ahh, Kyoto. I love Kansai, and although I wouldn't want to stay in Kyoto, that place is really good for trips. Wish I'd made a few more while I was back in Osaka. I wish I had your guide when I was in Kyoto! After 2 weeks in Japan I was craving sweet things and actually had breakfast at *gasp* McDonalds as the smell of their cinnamon melts lured me inside. I love your blogs - I've been learning so much about Japanese food and Japanese culture! I am hoping to take a trip to Japan this summer and am excited to use your maps. :) Thanks so much for sharing your recipes and insights. Between your recipes and my copy of "Recipes of Japanese Cooking," our household menus have been elevated quite a few notches in variety and deliciousness! I have kuzu and arrowrot both at home, they are very different. I assume many people think kuzu and arowroot are the same because I have read on few websites kuzu is the "japanese arowroot" what is wrong. Arowroot comes from maranta plant, I have some information on my blog about kuzu and arowrrot, also warabi-ko, but it isn`t translated yet into english(sorry, I`m from Germany). Right now I have 2 different kuzu flours here, organic and Yoshino kuzu, but I can´t tell the difference. 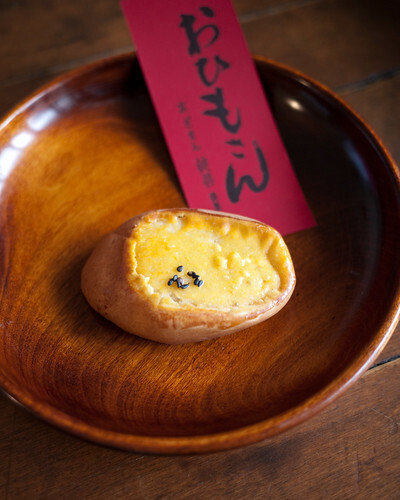 I thought the name of the sweet potato wagashi is kogane-imo, or is this something different? Mhm, mame daifuku...I love mame daifuku, but with kuro mame (dont like these aka endomame). Thank you for sharing this wonderfully detailed and personal view of Kyoto. A compelling and lovely post! I just came back from a weekend trip to Kyoto. Thanks to your wonderful postcards series, I was able to enjoy a lot of really fun activities -- including eating at this wonderful cafe! Unfortunately I almost missed it -- I had the address from your site and I checked your Google map, but because the storefront is only in kanji I nearly missed it! It might be helpful for future travelers if you include the kanji somewhere here so they can show it to a taxi driver, a pedestrian, etc., and not miss this great chance! Hi Maki! Hope you're fine! Your website is wonderful and a great inspiration for me!!! I have a question about kuzu kiri. Last Monday I have attended a Japanese cooking lesson about sukiyaki. Since the chef was from Osaka, he used kuzu kiri for his recipe. Unfortunately I can't find in Italy that kind of noodle, so I'm wondering if I can use shirataki noodles instead of kuzu kiri ones. Please, give me an advice about possible substitutions! Sure, you can use shirataki noodles. That's what is originally used anyway (sukiyaki originated in the Kanto (Tokyo) area). Just be sure to rinse and blanch them in hot water before using them in sukiyaki.